BRIDE OF FRANKENSTEIN (1st Edition) is a 4 color (with 2 metallic inks and glow-in-the-dark layer) 18"x24" hand-pulled art print. Printed by New Flesh on 100lbs French Whitewash fine art paper. 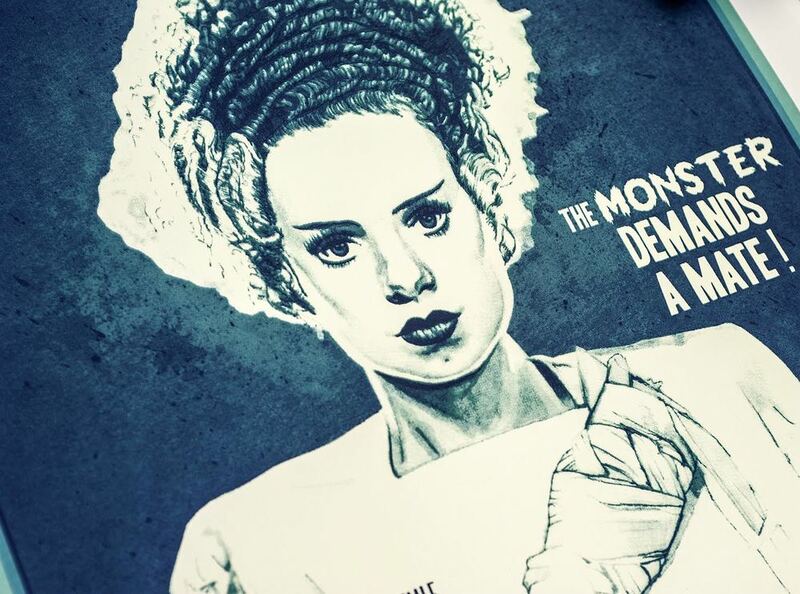 BRIDE OF FRANKENSTEIN (1st Edition) is signed and numbered with an edition of 35. BRIDE OF FRANKENSTEIN (Variant Edition) is a 4 color with 3 metallic inks and glow-in-the-dark layer 18"x24" hand-pulled art print. Printed by New Flesh on 100lbs French Whitewash fine art paper. BRIDE OF FRANKESTEIN (Variant Edition) is signed and numbered with an edition of 15.